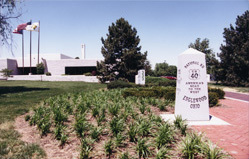 Englewood Government Center before and after. 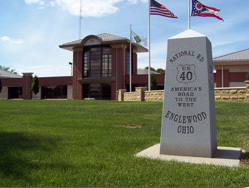 In 2005, the city of Englewood completed a $5.5 million project to renovate its Government Center located at 333 West National Road. The project included the renovation of the existing police department to become the newest city fire station, plus a building expansion that created a new, state-of-the-art police department and finally a facade facelift that transformed the character of the building entirely. The feather in the cap is the building’s entrance which features a beautiful winter vestibule that is warm with sunlight and lit by a brilliant chandelier. 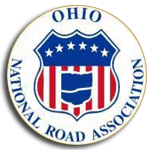 As you travel along the Historic National Road, be sure to stop in for a visit at the Englewood Government Center to see National Road Revitalization at its best.